The Grand Bombard was created as an improvement to the bombard in the early 15th century. Made to be harder-hitting and with longer range than its predecessor, this iron-forged piece of siege artillery is able to inflict punishing damage on enemy defences. 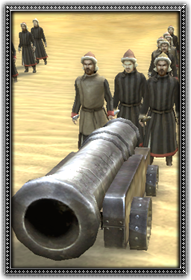 Like its predecessor, it too can deliver flaming chastisement to enemy troops.